I’m on my fifth PUR faucet mounted filter over about 3 years, partly because I bought a bulk quantity of the expensive filters with the first one. The first two were the more expensive with the side knob that switches from faucet to filter. Both started springing leaks before the first filter replacement. I then tried the simpler less expensive model FM 3400. This one behaved just like that in the Meyer photo – same timing as well. I called PUR (Proctor and Gamble) and they spoke of a temporary quality control issue, but that the offending units were now out of inventories. They sent me a coupon for a replacement. I was able to acquire 2 3400’s about $25 each versus one with the knob (about $50). The first 3400 (installed Nov 08) has just developed a crack from which water sprays about 6 feet to the left. I called PUR again, they have another coupon on the way. Its rediculous that a chronic problem like this hasn’t been resolved by Proctor and Gamble. One would think they’d be concerned about class-action issues. I asked whether one should be concerned about ingesting plastics chemistry since the outer shells seem to be dissolving as a part of (or resulting in) developing hair-line cracks and pin holes… The rep said she would make a note. For now, P and G seems satisfied to ignore the fundamental problem (must be millions) and to send replacement coupons! I also have gotten replacement coupons, I got the most expensive filter (stainless with a fixed filter, just a knob on the side. I’ve had that one now fail with it leaking around the knob and at the section where the filter housing comes together. I’ve now given up on PUR filters and instead am trying a locally made brand that normally does whole house filters. I picked it up at Farm and Fleet (Menards also sells them, look in the plumbing section for whole house filter units, they also have no-name faucet filters too). The filters are about $2 each (which reflects the cost of the materials that go into them, not the $16 marked up price on these things). Good Luck, you’ve inspired me to call them an complain about my replacement filter that also failed, I’ll take pictures of that one and post those as well! I have gone through 5 or 6 of these filters the past 2 years. They work fine at first, but 60-90 days later they begin to leak and spray at the pivot point. I have been returning them to the store replacements. One of them actually lasted beyond the 90 day warranty, so I bought a new one and used that receipt and packaging to return the old filter for a cash refund. I don’t feel I am doing anything wrong. If PUR would make a more durable product I wouldn’t have to resort to this practice. Besides, we also bought a large box of replacement cartridges when we bought the first one and want to use them up. What is your water pressure? I’d be interested in seeing the inside of your cracked filter housing. 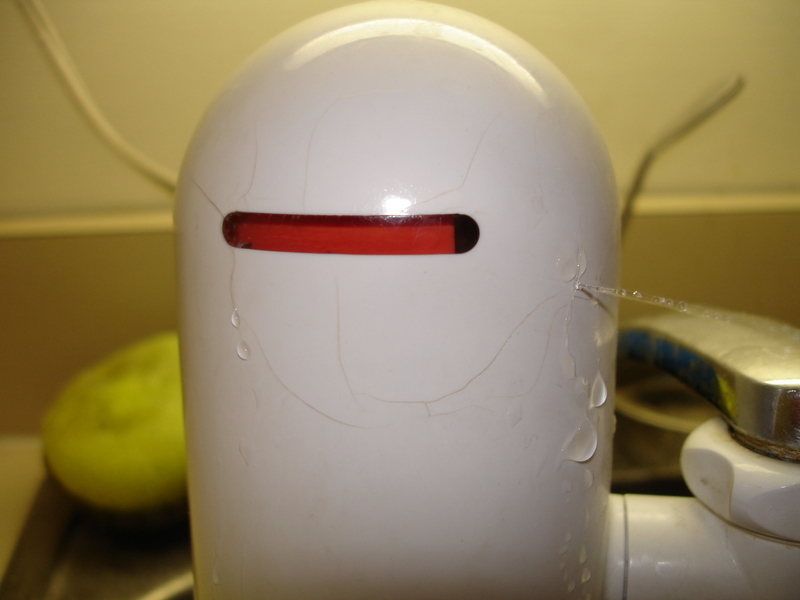 Did you have a practice of swiveling the filter on and off with the faucet at maximum flow? That would probably add a lot of stress to the filter assembly. 1) You don’t want the filter to be attached to the hot water line (bad defensive design). 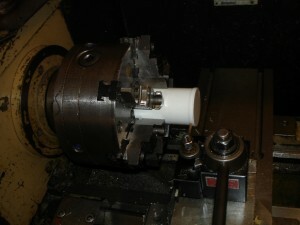 2) The swivel valve can subject the filter cartridge/housing to quick pressure changes. 3) The filter’s positioning on top of the kitchen faucet takes up valuable kitchen real estate. The filter housing is something of a 50-70 PSI pressure vessel that makes a great target for dishes and pots and pans to clank into. 4) The faucet assembly is sold under a razor blade model. 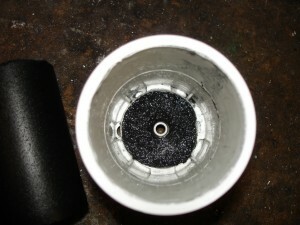 It needs to last a handful of filter lives before failure to ensure profitability. Regular kitchen fixtures usually cost $100 and up and are installed by a plumber or a homeowner who knows some plumbing. It’s an inevitability that soccer moms will be upset when they see that their PUR filters cannot hold up the way their designer Kohler fixtures do. 1) Sweat a cold water line up from under the sink to about eye level against the backsplash area. Include a ball valve for control and a union for easy access. 2) Buy a filter housing with no moving parts. Find good filters. I agree that water pressure surges when the filter is rotate are likely to blame for why the plastic PUR filters fail over time. The inside of the filter was just spider webbed like the outside. With regard to water pressure, I’m a student and have moved to 3 different houses in the last 3 years, so I’m not sure what the pressure is, the plastic PUR filter failed on the 2nd floor of an apartment complex. The replacement metal one started bleeding water out all of the seams in the next house I lived in. Finally, I’ve had 2 Omnifilters die and Menards appears to be closing them out so I won’t have a chance to try another. 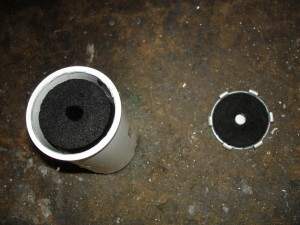 The first one is pictured in the post, the second one had the filter shatter when pressure was applied to it. I’d love to sweat in a filter under sink and just plumb it up to the faucet but I can’t in rental properties. You’re absolutely right that it’s the only way to assure good performance out of these filters. I am curious, where do you find filtration systems like this? The only ones I have seen around are the Brita brands. The other brands of filters are typically at Menards, Home Depot, True Value, Ace Hardware (all hardware/building materials) stores, the Brita brand has been merchandised into the big box chain stores like Walmart more successfully so you see their brand much more often. 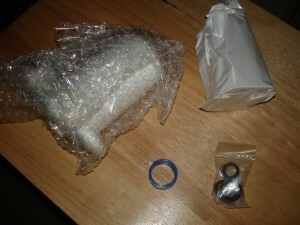 I bought the Aquasana 4000 filter system. I found this type of drinking water filter far superior to any others. Check out the comparrison chart on the website http://www.bestfaucetfilter.com.I have owned mine now for over 3 years and all i do is replace the filters. 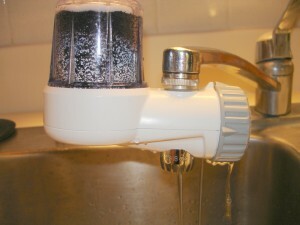 Why buy a cheap tap filter that doesn’t remove contaminants? Yeah! Pur is bad, they fall apart, so does britta I did finally buy DUPONT WF-FM100, the mechanism seems better with the water pressure inside the filter instead of outside as said above, but also i cut one of their FM100 filters open and also found not 2, not 3, not 4 but only ONE carbon filter as well (again as said above). BUT the good news is that it may be alot easier to CLEAN and resuse the filter than we think: What if we “backwash” the long used filter with Hydrogen peroxide (harmless in low quantities to humans), then clean again forward washing with clean water to remove any residual HPeroxide? In other words you can unscrew the housing as if you are replacing the filter, then by trial and error you will realize that the intake is the outer nozzle on the filter, so just force water (or HPeroxide) in thru the center nozzle to backwash the contaminates (mostly minerals i would think) out the other nozzle, then reassemble and run for 5 minutes to make sure its clean enough again. SO NOW you have a working system again that is still uncut, undamaged, and should output water at a higher rate than it was (more like it was like new). I may try this next time the filter gets too clogged up to get a descent flow (its pretty slow even when new but liveable for drinking water which is all we want). DOES ANYONE KNOW OF ANY FAUCET MOUNTED CHEAP SYSTEMS THAT WORK RIGHT AND HAVE THE CHEAP REPLACEMENT FILTERS TOO? Well we’ve been using the dupont filters for about 2 years now. They last longer than the other brands. And make our nasty tasting city water actually enjoyable. They’re cheaper too. Our daughter gave us her pur when ours sprung a leak (about every 6 mos) she said it only needed a filter $17!!! 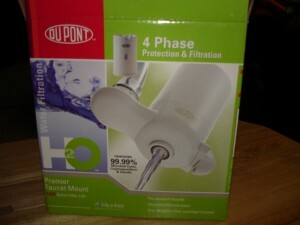 Right next to it dupont faucet mount filter with 100 gal filter $18. It may only be one stage of dupont magic – but it works. 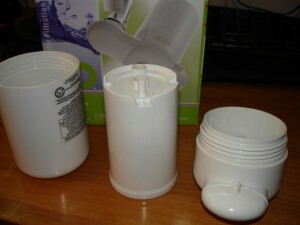 The new PUR filters as of Oct 2010 are redesigned, and do not develop stress cracks due to new material resins. I agree the old ones lasted 12 months at best.